In our culture, keeping the baby swaddled at all times is the norm. Even our doctor encourages that, as swaddling helps recreate the same environment for the baby as they had inside the womb – cozy and secure. When Baby K’tan reached out for us to try their infant swaddles available on Amazon, , I decided to give that a try especially since the swaddles are made of breathable fabric and 100% organic cotton. 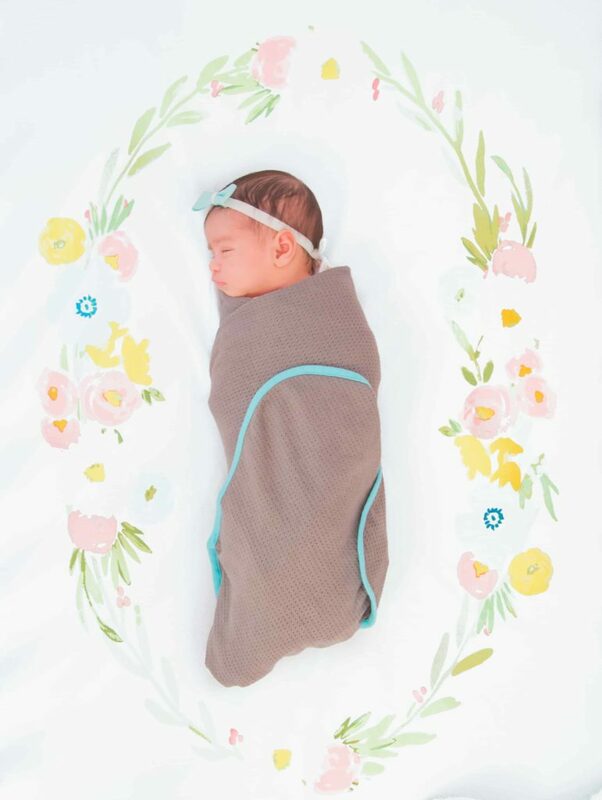 Since the weather has been unseasonably warm lately, these swaddle/blankets are perfect as they prevent overheating for the baby. Since my little ninja warrior doesn’t like being swaddled tightly, especially during her awake-play hours, we have been keeping her loosely swaddled in these blankets. They come in a pack of two and I’ve kept the second one in the diaper bag. Super useful like when you want to throw something on the baby when she is in the car seat or when you are taking a stroll and want to tuck her with a light blanket. They can be used as nursing covers as well and while I haven’t had to try nursing in public yet, having a multifunctional blanket handy is a good idea. Thank you to Baby K’tan for partnering on this post. All opinions are my own. OMG! How precious and how sweet is Zoe’s room! I just love it!! Zoe is absolutely adorable! I am loving her pretty nursery! I cannot get over that unicorn! So cute! So many babies hate the swaddle when they gain a little more weight it helps :)These swaddles sound amazing! Anything to help a baby be more comfy right? She looks so beautiful. I love the floral blanket. Really cute touch.